Over Thanksgiving, Nick and I visited our very first tree farm to pick out a little Christmas tree for my family. I lived in the upstate NY area for many years and didn’t realize this gem of a place (Ellms Farm) was nearby! They have a tractor trolley to take you from field to field, a fire pit to defrost your hands by, adorable farm animals, and a free hot cocoa station (…I always knew where to find my husband). With our luck, it was one of the coldest days yet so we made sure to bundle up in cozy scarves and our SOREL boots. I’ve been loving their insulated weather boots as an alternative to rubber rain boots when I know I’ll be out in the cold for a long period of time. Above, ambitious tree novices on the trolley, trying to decide between visiting the tall (7 – 8 feet) or extra tall (10 – 12 feet!) tree fields. Turns out a ~5 footer was already quite the workout for the two us to cut down and haul home! I have gotten more questions on sizing about this particular style of boots, so want to reiterate that this particular style runs a little small. Once again I mistakenly thought I ordered a 5.5 in an initial post, but mine are actually a size 6 which fit fine with thicker knit socks. In most American brands I’m usually a 5 to 5.5, so I’d suggest going up half from the size you most commonly take. And for your guys, Nick says his boots run about half size small as well. As some of you may have seen from my snapchat last week, a lesson learned was that tree cutting can be a dirty job! Don’t wear your favorite coat unless it’s easily washable (thankfully we both had scarves to shield our shoulders while hauling the tree), and be sure to pick shoes fit for trudging on a farm. These sound like no-brainers but I saw plenty of cute flats on visitors around us that got muddied. If you’re visiting somewhere with cut-your-own trees, the farm will likely have saws and twine, but bring your own workers gloves if you have ’em to protect your hands from pine needles and sticky sap. I also lost my bet with Nick about which half of the tree is heavier to carry…I couldn’t make it beyond a few steps while carrying the pointed half ; ) Rigorous workout and all, it was so worth it to have the scent of fresh pine fill my parents’ house and to be able to decorate our first real tree with my little brothers. Thank you Sorel for partnering on this post! Love the photos! Captured some memorable moments. Did you raise the belt loops on your coat? Oh my gosh I love these photos they are adorable, I need to get a Christmas tree soon I love your beanie and coat!! Hi Jean! Always love your posts. Was just wondering what socks you wear for cold winters? Thanks! Real trees have always been a must in my family, and going and picking them has always been a favorite tradition of mine. You're right about dressing to get dirty though! Hi! Yes, about an inch. I love these photos! You two look so cute! I also liked learning more about the fit of those boots since they've been on my wish list for quite a while. Just want to share – Smart Wools are my absolute fave! You guys look so adorable! Such a smartly dressed couple 🙂 I'm going to look into those boots, may be a good gift for my boyfriend! Hi there, can you please let me know how you find the Burberry coats to run? I am considering the splurge and am not sure about sizing as I haven't had a chance to try any on yet. Thanks! These photos are too cute! You and your hubby are adorable. Love your look, almost wishing I celebrated Christmas so I could go pick out a tree! I have those Sorels and had to go up a whole size! They are a little roomy, but I also tried 1/2 size up and my toe hit the front when I walked. Aww, these pics are so cute! 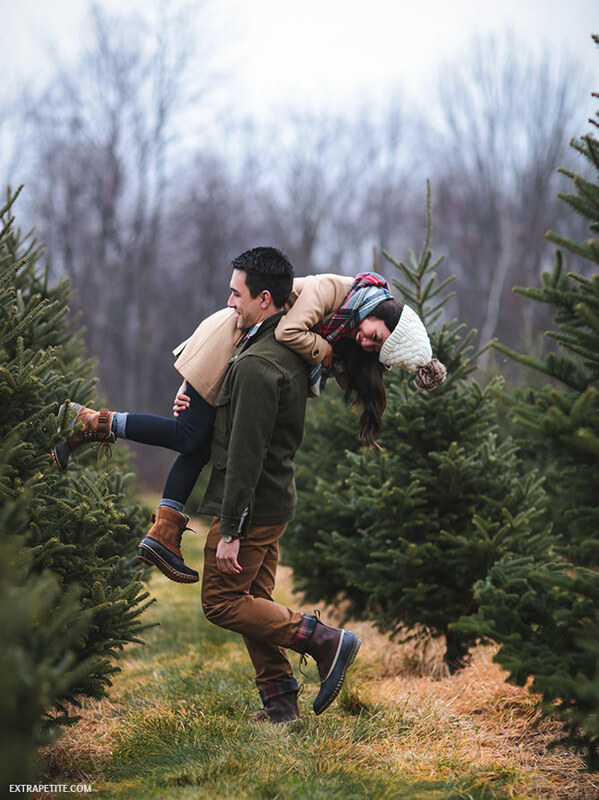 Picking out a tree was one of my favorite childhood Christmas traditions. Nothing like the smell of a real tree in the house! Beautiful pics and love your boots! Wow, you both are so ambitious cutting down your own tree!!! I am far too lazy to do that….Lol!!! Love your scarf!! South Moon has a very similar one!!! Your hat looks adorable too!! Hi Jean! I like Nick's pants – would you mind telling me what brand they are and where he got them from? Thanks! Hi! Please read my previous review on this coat (I linked to it right below the first photo). All of their coats run a little differently, but I'm usually a 0 in their London or Prorsum runway line and for this particular one sized up to a 2. Is it weird to ask, who takes your pictures on these occasions? The pictures are on point as usual! Your photos are very beautiful. I love how you and your husband bring love and inspiration to your blog. Please check out and subscribe to my blog. Getting the Christmas Tree is my favorite part of the holiday season! You look like you had a wonderful time! Absolutely adorable! I always enjoy your detailed posts and outfit pairings. And I especially love seeing you and Nick together. I recently purchased the Sorel Winter Fancy II boot in a size 6. They looked bulkier, but they fit. Debating on whether to return them or not. I'm 5'0, 94 lbs., and have shorter legs. They look so great on you, but not as great on me. Ha! Very cute!! I am super curious where you found his boots with the plaid inside, I can't find them anywhere!! !